As the first urban mountain bike park in the United States, Colonnade opened the door on an entirely new realm for the sport—and thanks to the then-fledgling Evergreen Mountain Bike Alliance, set the bar for what community-based advocacy could accomplish. Carson Storch styles a 360 while demonstrating proper under-Interstate form. Back in the early 2000s, Puget Sound riders wanting steeps, skinnies, jumps or drops had to load up the bikes and either hightail it 90 miles north to Bellingham’s Galbraith Mountain, join the Canadians in Whistler’s bike park, or find a “creatively constructed” trail before law enforcement did. 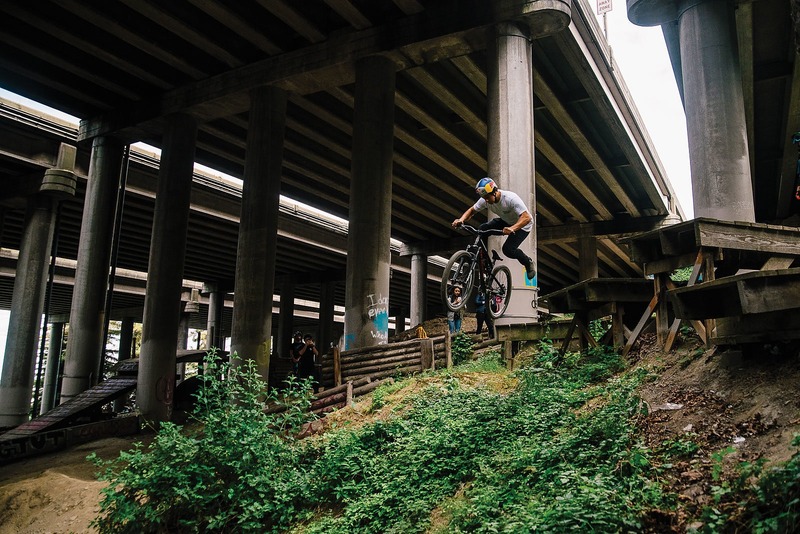 Meanwhile, Simon Lawton—owner of Seattle’s Fluidride bike shop—was scratching in trails and jumps through the vacant lots under I-5. At the time, homeless encampments, drug use and even dirt bike and ATV poaching marked the area as a place to avoid. So Lawton came up with an idea: Fill the space with an ultra-compact bike park, giving Seattleites a place to ride and potentially replacing less-reputable activity as well. Lawton pitched the concept to government officials, and while it fell on open ears, it would take a decade of discussion, three years of community meetings and the involvement of the Backcountry Bicycle Trails Club (BBTC) to make the bike park a reality. To fund the project, the club applied for grants, sold engraved stones and made sponsorship deals with local companies, and in 2004 the City of Seattle and Washington State Department of Transportation gave the park dual thumbs up. Finalizing the agreements took an additional year, but by 2005 volunteers were putting in hours of sweat—more than 13,000 hours total. The Colonnade’s first trail opened in 2007: the Limestone Loop, an intermediate/advanced gauntlet stacked with switchbacks, technical rock rolls and a long roller-coaster bridge. In 2008, Phase II added more options like Tqalu Trail, a novice line full of log rolls and skinnies, and the Advanced Area, a zone packed with jumps, wall rides and elevated skinnies. With that, Colonnade officially became the first urban mountain bike park in the nation. While Evergreen Mountain Bike Alliance moved on to bigger endeavors after the completion of Colonnade, the project proved a few passionate volunteers, grant funding and a lot of sweat equity could accomplish big things. A decade after Colonnade’s opening, residents—and globe-trotting professionals like Carson Storch—are still enjoying its features. Its popularity was all but guaranteed from the getgo. Quick laps, easy access and no commute meant city-dwellers could get a mountain bike fix on their lunch breaks. But beyond building fun and progressive trails, Colonnade proved the BBTC could manage complex land-manager agreements, all for the benefit of the community. The door to legal Washington mountain bike trails had been cracked open, and the implications weren’t limited to Seattle. Land managers and mountain bike organizations around the country took notice of Colonnade’s positive impact. Washington D.C. and New York City even joined ranks of U.S. cities with urban ride centers, using Colonnade as an example. Just as trail-access standards were changing, so was the non-profit behind the scenes. The same year Phase II of Colonnade was completed, BBTC merged with the Concerned Off Road Bicyclists Association to form Evergreen Mountain Bike Alliance. Riding the Colonnade momentum, Evergreen expanded further into complex projects, forging a strong relationship with the Washington Department of Natural Resources (WDNR) on the Tiger Mountain expansion. Call it the “Colonnade Effect:” build it—and build it well—and they will come. The newest “it” came in 2010, in the form of King County’s Duthie Hill Bike Park. Where Colonnade cracked the door, Duthie knocked it off its hinges. King County officials had awarded a grant to help fund Colonnade, and the project’s success convinced them to partner with Evergreen to create Duthie Hill. Featuring all-ability, progression- focused trails in a stacked-loop system, Duthie opened in 2010 and over the next two years grew to cover more than 120 acres. It was Colonnade and then some. With Seattle riders gravitating toward nearby Duthie Hill and Tiger Mountain, Colonnade’s population of regulars may have dwindled in recent years, but it remains the city’s go-to spot for airtime. Just ask Carson Storch. By 2014, Duthie was seeing 120,000 visits a year. Its popularity motivated Evergreen to expand Tiger Mountain’s trail network from 7 to 20 miles, and spurred work on Swan Creek in Tacoma. This led to more large-scale projects, including the Olallie and Alpine Baldy trails, the North Mountain Skills Area outside of Darrington, and the Raging River trail network above North Bend. Evergreen and WDNR have plans to connect Raging River to Tiger Mountain, a system that will span 40 miles. Meanwhile, back under the rumbles of I-5, Colonnade was becoming a victim of its own success. Duthie—which Colonnade helped create—was pulling riders away from the urban park in favor of forested surroundings, similar door-to-door commute time and a larger variety of trails. Built for now-absent full-suspension bikes, Colonnade’s advanced—and least-used—features took up the biggest section of the park, leaving little room for more user-friendly terrain. A lack of riders created a vacuum and, combined with Seattle’s homelessness crisis, negative usage in the area returned. Still, the park hasn’t been abandoned. Evergreen staff has proposed several changes, including updating unused skinnies and advanced jumps with kid-friendly features, adding an XC or commuter trail, and relocating and expanding the pump track. But Colonnade’s legacy isn’t features, or convenience, or community safety. It’s the community that built it—and the community it built—and the impact it has made around the globe. Fueled by passion, Colonnade is more than a park. It’s the embodiment of an idea.